Automation is transforming virtually every industry, but it isn’t necessarily a threat. Discover its impact on the future workforce. As the CEO of a global organization, a big part of my job is responding to the concerns of businesses and workers all over the world. But wherever I go these days, there is one topic that seems to be on everyone’s mind: automation. Today, it’s clear that fears about the potential impact of artificial intelligence and automation are on the rise. By one estimate, up to 800 million jobs globally could be displaced by automation by 2030. Almost 60 percent of Americans consider automation a bigger threat to employment than offshoring, while 73 percent say that AI will destroy more jobs than it creates. However, while we’re clearly in a period of disruption, these new technologies don’t need to be a threat. Automation may be transforming virtually every industry, but the reality is that, in most cases, it’s not jobs that are going away— it’s tasks. In general, it’s the more repetitive, mundane tasks that are being affected. That means the jobs of the future will be more engaging, more flexible, and more globally oriented than ever before. Now, it’s up to businesses to seize this opportunity and prepare their people to succeed in this evolving world of work. Until recently, a typical factory worker spent the day manning an assembly line or driving a forklift. Today, the same worker is often responsible for operating robots and other highly sophisticated machines. This is merely one example of how work is transforming. At EY, we already see the impact of these trends. We now have more than 1,700 robots automating repetitive tasks like generating invoices and reviewing routine contracts. We’re also working to start using drones for inventory observations. In both cases, this generally means that our people will be able to spend less time on tedious tasks and focus instead on more complex, nuanced challenges. That’s why, even as we embrace artificial intelligence, we’ll always need great people. In fact, more than 65,000 people will be hired into EY globally in 2018. To meet the needs of this changing world, we’re recruiting new kinds of people, too. We look for business school graduates who also have some fluency in areas like analytics and computer science. In addition to people with workforce services backgrounds, EY’s professionals now include more than 18,000 data and analytics practitioners, and more than 2,100 data scientists working around the world. As we look to the future, it’s also clear that many students and future workers will be working with technology that hasn’t been invented yet, solving problems that haven’t been identified yet. To be successful, they’re going to need to be constantly learning and acquiring new skills. That’s why, when we recruit today, we focus on people’s mindsets, not just their skillsets. In a rapidly changing world, they need the mindset to adapt, to grow, and to innovate. As the nature of individual roles evolves, so is the composition of the workforce itself. One of the keys to success is building global teams that are inclusive of diverse talent and that leverage a variety of skillsets and professional experiences. We focus on people’s mindsets, not just their skillsets. The jobs of the future will be more engaging, more flexible, and more globally oriented than ever before. In recent years, many businesses have worked hard to remain agile, bringing together teams of individuals that cross borders and business lines to improve performance. But, as challenges have become more complex, so must the solutions. Now, businesses must draw on an entire external ecosystem to assemble top teams. At EY, our people are not just working with someone down the hall. They’re also working with bots, newly acquired IP, alliances around the world, and team members at centers of excellence from India to Poland. Increasingly, they’re also working with freelancers that offer highly specialized skills in things like data analysis and robotics. Today, there are unprecedented opportunities for freelance or “gig” workers who want more flexibility to find work outside the confines of a traditional 9-5 job. That’s why EY created a new global talent marketplace called GigNow, where we post short-term assignments, making it easy for recruiters to match contractors with relevant projects at EY. GigNow is currently available in eight countries, with a network of more than 13,000 people. We treat these freelancers like members of the team, offering them feedback, coaching and educational opportunities that benefit them throughout their careers. Some have also been hired as full-time employees. 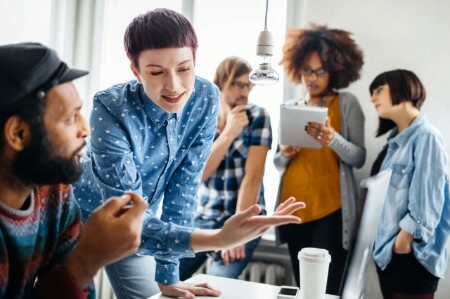 This is the new, multidimensional workforce that digital technology is driving: employees working alongside external partners and freelancers from all over the world—and, yes, alongside technologies like artificial intelligence—to deliver the strongest possible performance. It’s the future of our services at EY, and I believe it is the future of work. This article was originally published by Milken Institute, under the title 'Forces Defining the Future of Work'. Digital technology is paving the way for a new diverse workforce, where mindsets will be more important than skillsets and work will become less repetitive.